Resist the snacking siren call. By Bailey King·	 1/9/2018, 11:42 a.m.
We’ll take almost any excuse we can get to work from home. And why not? Who wouldn’t want to stay cozy in your most hygge-approved wears and sleep in later (because, you know, there’s no commute to your kitchen table)? Yet, while we’re fans of these perks, working from home can also pose a threat to your waistline. Spending all day working in close proximity to a sea of snacks can test the most strong-willed of us all. Plus, you’re less likely to move much as you do at the office because, unless you live in a mansion, chances are you’ll never have to walk very far. 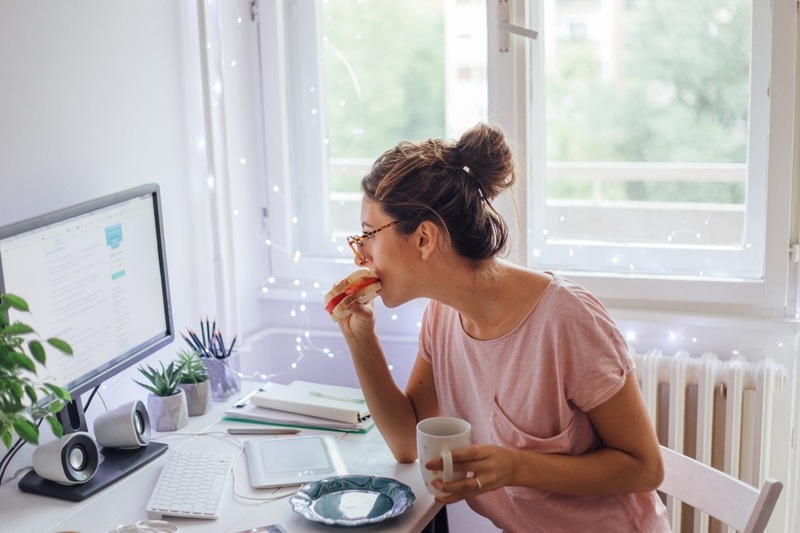 To make working from home a healthier experience, we called on local health, nutrition, and fitness pros to share their top tips for working from home, made healthier. Check out their tips below. Don’t procrastinate on eating lunch. “It’s easy to get lost in a project and ignore the hunger pangs: Just five more minutes and I’ll make lunch. Procrastinating your nourishment is a recipe for overeating for the rest of the day. I make sure to set a lunch time and remove myself from work for those 15 to 30 minutes. I also make make sure to eat a really substantial lunch that will keep me satiated for four to five hours, that way I’m not distracted by cravings in the mid-afternoon. Lunch is always a balance of protein, a little bit of healthy starch and lots of good fat. Example: Salad with chicken, avocado, and a sweet potato (that I cook in the microwave for three minutes).” — Juliet Burgh, Nutrition Director, Unite Fitness. Or just schedule a healthy food delivery. “If you live in the city, you can order healthy take-out if you don’t have anything in your fridge. My favorite is Snap Kitchen. I can order juices, snacks, warm entrees, cold entrees, even breakfast — and it’s fast. 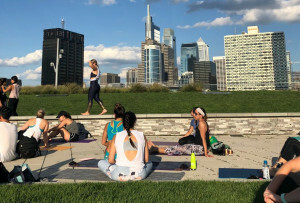 Plus, you can order ahead, which means as soon as you know you’ll be working from home, you can order and set a delivery time in advance.” — Jess Baumgardner, Certified Health Coach and founder of Health Coach Philly. Don’t stay in your PJs all day. “It is oh-so tempting to stay in your jammies all day when you have been given the green light to work from home. And, while staying snuggled up in your biggest sweatshirt with your laptop seems like the dream, it can lead to a feeling of malaise. 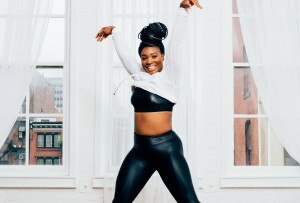 Even when you are stuck inside, getting up, showered, and dressed like you are heading out the door to conquer the day can help you feel energized and increase your focus and productivity.” — Ali Tomlinson, Certified Nutrition, Health and Wellness Coach and founder of IN-Power Performance. But do wear workout clothes. “Get dressed as if you’re going to the gym. I practically live in workout clothes, but for those of you who dress up for work, this is the best way to put yourself into an active mindset. Find a designated space for yourself to work — preferably standing — and schedule in a quick workout at home. But, whatever you do, don’t go near the couch. This is an easy way to get caught up in a Netflix marathon or a quick snooze.” — Jordan Hankins, founder of Fit Complex. Make drinking water more attractive. “Get a pretty water pitcher (and coaster to sit it on), fill it up, and place it on your desk with a glass and lemon wedge. I love the Soma water pitcher with a wood handle and a pretty gold and marble coaster from Overstock. Your goal is to drink this pitcher! Not only will this keep you hydrated, but it will prevent mindless snacking. Every time you are looking for something to do with your hands, fill up your water and drink it.” — Jess Baumgardner, Certified Health Coach and founder of Health Coach Philly. Set specific snack times. “There’s nothing wrong with a little snacking, but to ensure that a little snacking doesn’t turn in to a lot of snacking, set yourself some work goals that you need to check off before you stop for the snack you’re craving. I recommend setting a timer on you phone for 60 or 90 minutes, working diligently for that time period, and then getting up for a little stretch break that may or may not involve a special snack. Quite often you’ll get into a flow with your work and lose your desire for a snack anyway.” — Jolene Hart, Certified Beauty and Health Coach and author of the Eat Pretty series. Don’t try total abstinence. “I allow myself something sweet after lunch, and for me that’s always chocolate. Rather than trying to ‘be good’ and abstain from the temptation, I give myself permission. By controlling the amount and when I’m having it, it puts me in control and curbs my craving for later. 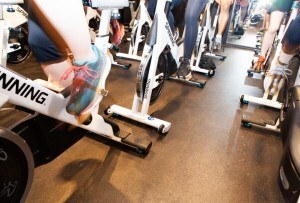 I recommend 72 percent, or higher, dark chocolate.” — Juliet Burgh, Nutrition Director, Unite Fitness. Pick snacks that hit all your cravings. “If you are a snacker, keep your snack game strong. My favorite snack is trail mix because you can hit so many different flavors in one go. Did you know that the best flavor balance is sweet, salt, fat and acid? This means the best taste and the most satisfying. I achieve this balance with cashews, almonds, dark chocolate, and dried (unsweetened) cherries or cranberries.” — Jess Baumgardner, Certified Health Coach and founder of Health Coach Philly. Ask if you’re actually hungry. “When you feel the urge to snack during the workday, it’s often more of a sign of boredom and a need to move around — or even a lack of hydration. So, head to the kitchen and make a cozy drink instead. Think warm lemon water, your favorite herbal tea, or blend up a three-ingredient matcha latte (matcha, coconut milk, raw honey) and add other superfoods like maca or moringa that will energize you and keep you focused. A warm drink is easy to digest, can be adapted to satisfy a sweet craving in a healthy way, and wont fill you so much that you skip a meal.” — Jolene Hart, Certified Beauty and Health Coach and author of the Eat Pretty series.